Coastal Bins state of the art waste bin cleaning system is environmentally friendly and fully self-contained. Our system cleans, disinfects and deodorizes your bins at your home or business. With specialized spray heads operating at 1100psi, spraying 200 degree water to not only break particles free but more importantly killing bacteria like Salmonella, E coli & Listeria. The system uses less than a quarter of the water as the average "Do It Yourself" job, which is extremely important during periods of drought. The 'Do It Yourself' method not only requires lots of water it also requires the use of harsh chemicals that cause harm to the environment when they flow into our storm-water systems that flow into our beautiful creeks and oceans. We collect wastewater on-board and transport it to the appropriate facilities to be handled properly. 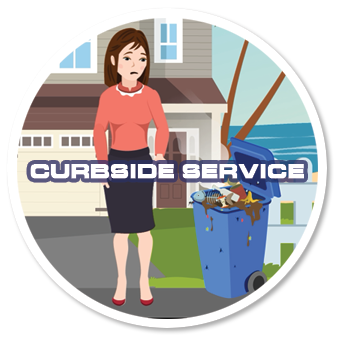 We service your bins curbside, in the same location the local waste hauler services your bins. Our specialized system is self-contained & we haul away waste water to dispose of properly. 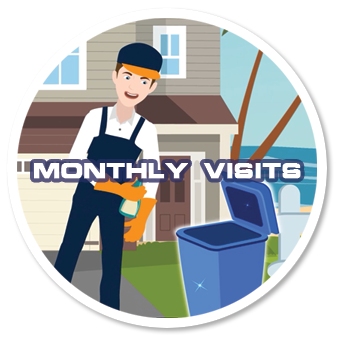 We suggest regular monthly cleanings to insure your bins are stink & pest free. Stink free cans are bacteria free & free of pests like ants, flies, maggots, rats, raccoons & skunks! By using our service on a reoccurring basis (at least once a month), your trash and recycle bins will maintain a respectable level of hygiene. Keeping you, your family, guests & housekeepers healthy & free of these hazards. Bins should be left curbside, in the same location the local waste hauler services your bins. We schedule all stops the day after your trash pick-up day. All bins will be inspected prior to each cleaning & all bins should be completely empty upon our visit to avoid damage to our equipment. Any bin with cracks, heavy material build up (paint, glue, tar, gum, etc.) chemicals or oily substances covering the bin can not be cleaned due to risk to our equipment. 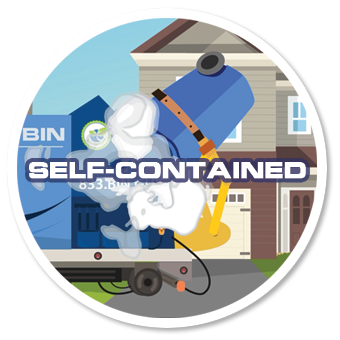 We will notify you via phone and email to have your bin replaced by the local waste hauler. You will receive automated reminders the day before your cleaning and once again the day of cleaning to ensure your bin is available for us to service. 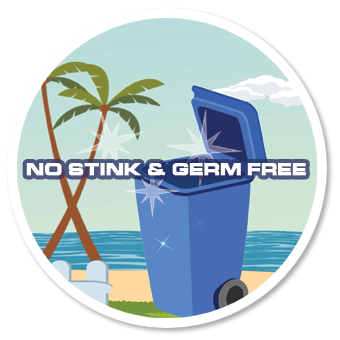 We look forward to keeping you & your loved ones safe from the nasty germs, bacteria & critters that a dirty bin attracts! View Pricing Packages or contact us with any questions. Currently serving: Private Residences, Apartment complexes, HOA's as well as businesses that utilize wheeled waste bins.